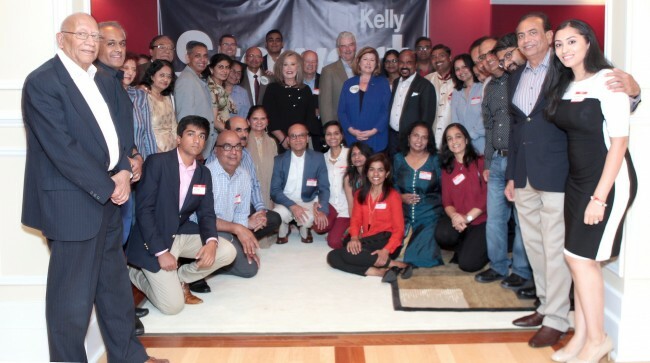 Atlanta, GA, October 26, 2018: Republican candidates Karen Handel, contesting for re-election to Congress from Georgia’s Sixth Congressional District, Kelly Stewart, contesting for Georgia House of Representatives to represent District 50 and Matt Reeves seeking election to the Georgia State Senate to represent District 48, interacted with the Indian-American community and the press at ta Meet and Greet event held at the home of Shiv Aggarwal, Owner of Global Mall on October 14, 2108. The evening commenced with Shanknaad and Shloka recital by Pundit Gyan Prakash Upadhyay. “Public office is not easy. Laws and lawmakers impact our lives on a daily basis,” said Aggarwal drawing from his own experience as chairman of Gwinnett Village CID (Community Improvement District) and president of American Management Systems, a corporate real estate group. “I’m in real estate and I know this personally- take the 1031 exchange, capital gain tax for example. We are still enjoying the benefits of this for the past 32 years,” he said. Narender Reddy endorsing the candidates. Reddy commended Stewart in her efforts in reached out to the voters personally. “I’ve never seen a person running for state legislature working so hard, knocking on doors. Usually they just send out mailings,” he said. She said the only thing on her mind going to Washington DC every week was to make the state and the nation better for everyone. 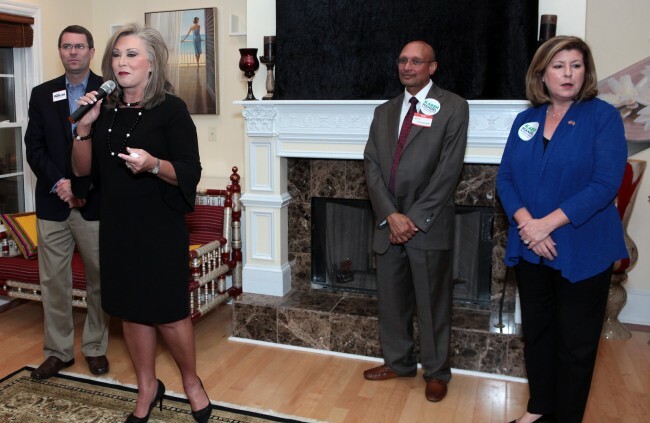 Endorsing Reeves and Stewart, Handel said she needed them to win. “When Johns creek or Fulton county needs help with a federal issue, we link arm in arm and we to fight for you. That’s why I need solid partners like Kelly and Matt,” she said. “We are asking for your vote, but will always, always, work hard to earn it,” she concluded. Handel was the Republican Georgia secretary of state from 2007 until 2010. “An average family of four gets a federal tax cut of $4400,” Said Matt Reeves. Lauding Handel, Reeves added it was an honor to follow the winner of the biggest congressional race in American history. “The difference between me and my opponent is that I’m focused on local issues and my support comes from people like you and my opponent gets her support from California,” Said Reeves. Pointing out that Georgia has been leading in business for the past years, Reeves said his focus is good schools, public safety, school safety, healthcare and traffic solutions. “Don’t forget to vote yes on local referendum on your ballot to lower your Fulton county property tax,” he reminded the attendees. Reeves is a business and real estate litigation attorney and partner at Andersen, Tate & Carr, He is a past Rotary Club President, Gwinnett County Bar Association President, Duluth Business Association President, and serves on the North Fulton Chamber of Commerce board. 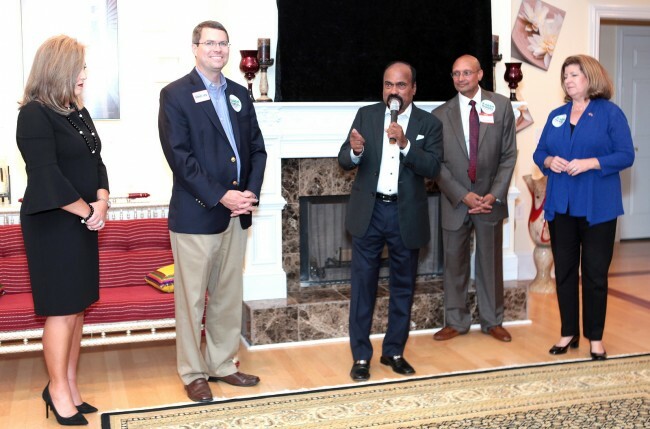 “The Indian community is a growing, thriving community in Johns creek. And you are a big part of what makes johns creek so successful,” said Stewart. Having served at Federal level for Gov. Deal, at state level as board of directors of the department of juvenile school board and as county administrator at city level, Stewart said she had private sector experience as well. Stewart has campaigned extensively, knocking on doors and connecting to people on a personal level. “I want to make sure Johns Creek is well represented,” she said.